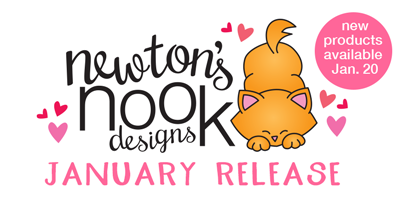 Hello everyone, welcome to Day 2 of #Newton'sNookDesigns January Release. Today I'm featuring a stamp set that really excites me. It's called Love & Chocolate and has a coordinating die set. So immediately I was drawn to my absolute favorite, chocolate covered strawberries! Years ago, my family and I would attend the Strawberry Festival in Cedarburg, WI every June. There's a confectionery on Main St. that would hand dip these HUGE strawberries and display them right in the front window. Oh they were so good!!! I'm a long way from Wisconsin and these are definitely a summer treat. So for now, I'll enjoy coloring them!! I did a lot of masking to create this scene. I stamped the little strawberries right on my post it pad, then fussy cut a bunch of them to cover up the lower layers as I stamped my way to the top of the pile. I then copic colored all the berries and used glossy accents on the chocolate..trust me, in person, they almost look real! I die cut and colored the serving plate to look like Jadeite. The red gingham paper by GinaK served as the perfect bottom layer around my scene! My zig zag rectangle is by SugarPea Designs. I also inked the background and splattered with a bit of white acrylic paint. I hope you've enjoyed my creation, thanks for stopping! Read below for your chance to win! Would you like to win the “Love & Chocolate” Stamp Set? Wow! Worth all the masking. You should frame all that sweetness. What an adorable card--you did so much work! Love the gingham background, it is perfect! Who doesn't love chocolate dipped strawberries?! These look delicious. 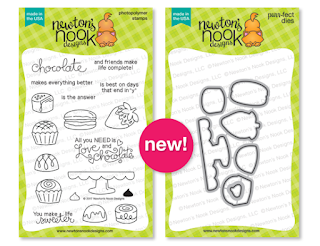 Love how you used this stamp set and those strawberries look so sweet! Awww!!!! Such yummy and delicious card!!! I would love so much to eat those strawberries!!! Love these yummy strawberries covered in chocolate. This is really one delicious looking card!!! Love the chocolate covered strawberries and the other items on the set! Beautifully colored and created. Who doesn't love chocolate covered strawberries?! Oh my! Such a berry delicious looking card!! :) You've done an amazing job with the coloring!!! I love it! Love how you stacked the berries on this very cute card. Wow your coloring is amazing. The strawberries look good enough to eat!!! Your card looks so amazing and the masking idea is so great. I really like it. Amazing card! Turned out super cute and sweet! Awesome card, making me crave some chocolate covered strawberries! Love the colors on this cute card! Fun idea! Great card with creative masking! Love how you stacked the images to make such a yummy tower. Awesome card. Super adorable - I love this strawberry pyramid! Oh what a delightful treat! Love those yummy strawberries! YOUR - COLORING - WAS - AWESOME! I LOVE the richness & depth you obtained coloring those mouth-watering-looking strawberries and all that masking certainly paid off in my opinion, BRAV-O!! Great coloring and love how you showcase the stamp! very cute card & set. I'm super impressed by your coloring skills....those leafy stems are colored perfectly! This is luscious! Great coloring and masking. Great card with beautiful coloring. You make me want to eat strawberries with chocolate now! EEK!!! This looks good enough to eat! I LOVE IT!!!! This is the cutest! I love the colors in the strawberries! Gimme' chocolate strawberries - Now. I love how you made a strawberry cake out of the strawberries! The detail is beautiful! These look so plump and juicy! Love that gingham paper with it. I'm no fool though, I know real strawberries in chocolate look good but taste nasty... maybe it's just me but ick! What a yummy card! Gorgeous coloring! Great card. The coloring is amazing. This card is fabulous! Great job masking all of those yummy strawberries! Oh AJ I have a similar love affair with chocolate dipped strawberries! My friends mother used to make them for sale at a local speciality shop when they were in season and I can remember eating them until I felt sick 😂😂😂. Your card is a work of art! I know it must have been a lot of work, especially all the masking, but it is so worth the end result - simply divine! Thank you for showing me yet another reason why I must have this stamp set! It is my absolute favorite set of the whole release (and that's saying something because there's a lot to love in this release!). Your masking job is incredible! Chocolate-covered strawberries are my favorite! !